This is a view of the Territorial Prison in 1907. The wagons are hauling two tractor wheels from the foundry. The view is looking north on Main Street. Photo credit is Mr. John Runk, courtesy of The Stillwater Public Library, John Runk Collection. Click or Tap on the photo to view a "Time-Tunnel" morph of this same location going from 1907 to 2016. To view this same location as it appears today, click or tap on this link. Courtesy of Google maps 360 Street View. The Images above are showing the same location going from 1907 to 2017 via an animation "Time Tunnel". The Historical Photo is from the John Runk Collection, courtesy of the Stillwater Public Library. The Stillwater prison was built in 1851 as part of the territorial plan. The site was known as “Battle Hollow” because of a Native American skirmish in 1839. Twenty-one members of the Ojibway tribe were killed by members of the Dakotah tribe. The prison and the warden’s house were completed in 1853 and other additions were made to the construction site in later years. Jacob Fisher, a millwright, designed the buildings and also staked claims where Stillwater presently stands. The warden’s house is the only building left which was part of the original prison plan. The structures were made of locally quarried limestone and were framed with lumber. The prison was used from 1853 until 1914 when the prisoners were transferred to the new prison, located to the south of Stillwater. Many of the buildings in the old prison were demolished in 1936, while some were still used for various businesses until 2002, when a fire demolished the last buildings. This photo was taken by John Runk in 1907. It is the front gate of the Territorial prison which was located on the west side of Main Street. The image shows the guard and two trustees outside the gate. To View a "Time-Tunnel" photo of this same location that allows you to travel from 1907 to 2016, just click or tap on the above photo. The Year is 1907 and this same location is now Terra Springs Condominiums. The architect designed the new towers to be located where the original towers were when it was the Territorial Prison. The two prisoners in the historic photo are trustees, while the armed guard keeps a close watch on everything outside the prison walls. This animation shows the overlap of the same location between 1907 and 2017. 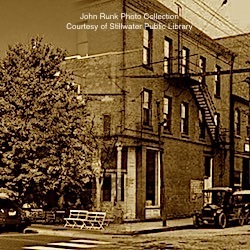 The historic photo is from the John Runk Collection courtesy of the Stillwater Public Library. This is a view of the Territorial Prison site in 1936. The prisoners were relocated to the new facility south of Stillwater at this time. The buildings were used for manufacturing businesses. The year is 1907. This is a photo by John Runk viewing west on the main road inside the prison. The prisoners are moving from a work area to their cells. In the rear is the infirmary of the prison. Photo courtesy of The Stillwater Public Library, John Runk Collection. To view a "Time-Tunnel" that takes you from 1907 to 2016 at this same location, Click or Tap on the photo above. Prison Infirmary, vantage point is facing northwest wall inside the prison. Photo credit, Mr. John Runk, courtesy Minnesota Historical Society, John Runk Collection. This is a Time Tunnel Animation of Prisoners Marching between buildings in 1907 and the same location in 2017 at Terra Springs Condominiums. The Historical Photo is from the John Runk Collection, courtesy of the Stillwater Public Library.